Cakes are synonymous with weddings, anniversaries and other major life milestone celebrations, and a birthday just isn’t complete without a birthday cake. (Just try throwing a birthday party for a kid without one, before you know it you’ll be reading out the riot act.) Rarely do you find a community event such as a school or church féte without a cake stall loaded up with sponge cakes and lamingtons baked lovingly by (in most cases) the mums and nannas. Even the Vikings loved cake. In fact, the word cake comes from the old Norse word kaka. So whether we like it or not (I like it), the cake is here to stay. Funnily enough, I grew up not really liking cake very much (I know, I’m at a loss for words at that as well). Cake just didn’t rock my boat as much as a chocolate crackle or a honey joy, and I didn’t like European cakes very much (thankfully these days I know much better). As a child I was forever being dragged by my mother to the famous Acland Street cake shops in Melbourne’s St. Kilda, usually Monarch. Despite the astounding selection presented, I would only ever pick a coconut macaroon or smiley face biscuit (it had Smarties for eyes and a filling of raspberry jam). Many a visit was also made to Elsternwick’s famous Jewish bakeries, Glick’s and Aviv. Again despite the myriad of beautiful continental cakes, pastries and biscuits on display, I would only pick the usual suspects (FYI to this day Aviv make a fabulous macaroon). As I’ve grown older I have come to love cake and I very much enjoy baking. I have a small and sound repertoire of go-to cake recipes under my belt which I’ve had a lot of fun creating. A far cry from someone who used to be terrified of what would happen if I mixed together flour, eggs, sugar and butter in case I “messed it up”, I have replaced fear with curiosity. To me, baking is a science and the kitchen is my lab. Unlike other forms of cooking, it isn’t terribly forgiving if you change quantities of ingredients and swap this for that, so you learn to respect recipes which, are essentially, formulas. For example, you can alter the sugar content of a cake slightly, but change it too much and you start waving a red flag at baking-failure because the sugar ratio has been specifically worked out to be in accordance with the ratios of flour and fat. With the exception of the occasional batch of cookies I made in home economics class at school, I didn’t grow up baking. I did however witness my mother on countless occasions in baking frenzies. The family kitchen would be taken over by a multitude of cake tins and billowing clouds of flour (my mum never did anything by halves in those days) and generally it was best to steer clear or watch from a safe distance. Perhaps some of it was absorbed through osmosis, because there are certain “sweet, baked, breadlike” foods I’m rather good at making, such as this gluten-free Spiced Orange, Almond and Coconut Cake. I’ve always been intrigued as to how you can take a whole orange and incorporate it with other ingredients to create a sweet cake. When I was writing this recipe, I made many versions with oranges boiled for different times and I found that one hour worked best to remove the bitterness. 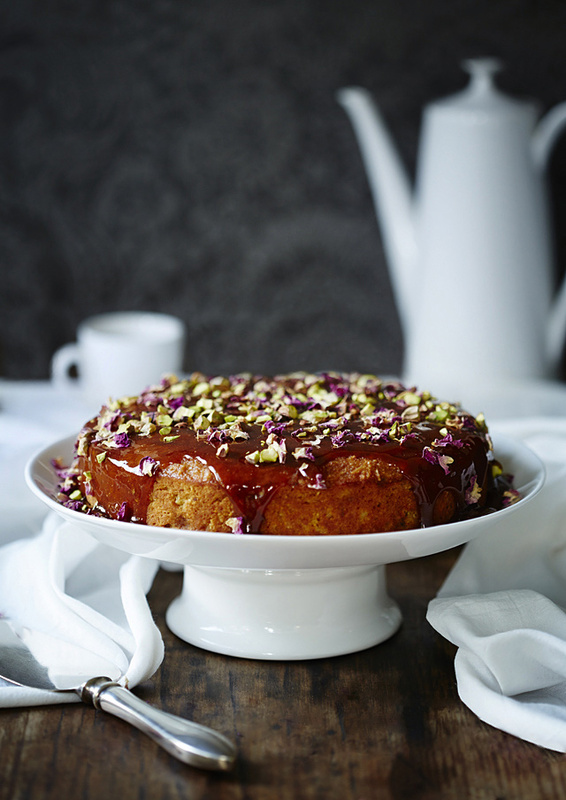 The oranges, almond meal, coconut, spices and syrup come together to make a cake worthy of a place at a sultan’s table. Incredibly moist (there really isn’t a better word to describe it, I mean you’re hardly going to call a cake clammy), this cake has a beautiful flavour, texture and smells divine. A perfect end to a Middle Eastern-inspired meal, be sure to serve it with thick double cream and strong black coffee. Belly dancers are optional, though I think the Vikings may disagree. Makes one 20cm (8″) cake. Prep time 30 mins, cooking time 2.5 hours. * Please note I have intentionally left the cake borderline sweet, meaning that if you like your cakes really sweet, you can increase the sugar to 1 cup. I find however that the syrup brings the overall sweetness up significantly and creates a perfect balance. * Jaggery is an Indian sugar made from unrefined cane sugar, coconut sugar or dates. It comes in blocks which you can smash or grind into small pieces (I grind mine in a Thermomix). 1. Preheat oven to 150˚C (300˚F). Grease and line a 20cm (8″) cake tin. 2. Scrub the oranges thoroughly (particularly if not organic) and place in a heavy based saucepan and cover with an inch of water. Place over high heat and bring to the boil. Lower the heat, cover and boil for one hour until soft. Drain the oranges, allow to cool, then purée in the bowl of a food processor on high. Set aside. 3. Combine the almond meal, dessicated coconut, shredded coconut, sugar, baking powder, cardamom, ginger and cloves in a large mixing bowl. Set aside. 4. Combine the beaten eggs, orange purée, orange juice and vanilla essence. Pour the mixture into a well in the dry ingredients and gently fold through until just combined. Pour batter into a prepared cake tin and bake for 90 minutes. The long baking time and lower temperature ensures the cake cooks through thoroughly and doesn’t over-brown the top. If you find your cake is over-browning, cover it in foil for the remainder of the cooking time. 5. When cooked (the cake should be quite firm yet still moist in the middle), remove cake from oven and allow to cool in the tin for ten minutes before turning out onto a cooling rack. Allow to cool before serving. This cake is lovely warm, but it does need some time to set otherwise the centre will be too soft. 1. In a heavy based saucepan over medium heat place the jaggery, caster sugar, honey, orange blossom water and tablespoon of water. Stir until the sugar has melted and all ingredients are combined. The jaggery might need some work with the back of a wooden spoon to get out all the lumps and be worked into the melted sugar. Let cool slightly then pour over the cake. 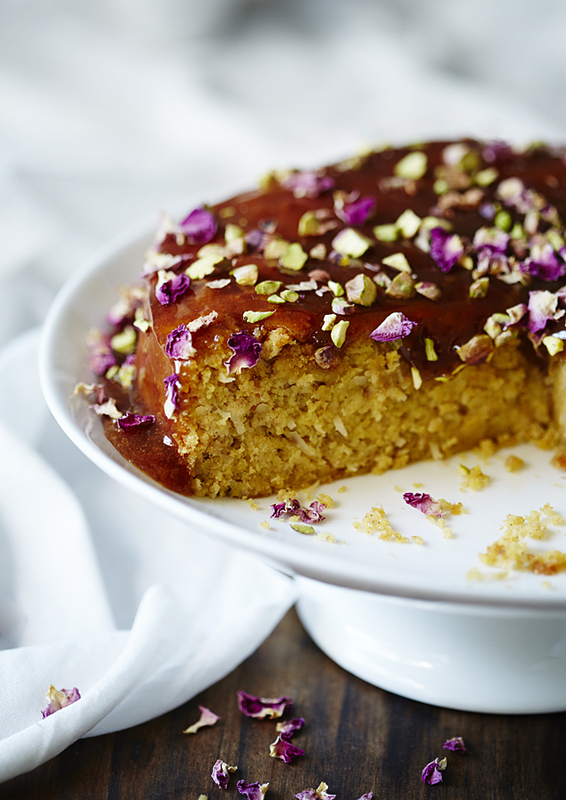 Scatter over the pistachios and rose petals. Please note that if you are making the syrup a day ahead, adding a tablespoon of light corn syrup will help prevent crystallisation. I don’t normally use this product but it is the only thing I’ve managed to find which stops sugar crystals forming on these types of syrups. Such a beautiful cake needed only very simple props so I kept it simple with a white cake stand (picked up at Vinnie’s for a couple of dollars). The cake knife is a vintage piece purchased from a lady who sells old wares at the Manly markets here in Sydney. The vintage porcelain coffee pot is German and was a gift from my next door neighbour, it belonged to his mother. The coffee cup and the cloth are out of hard rubbish collections as is the timber surface. The only light used in these images is window light. Never heard of jaggery syrup before, but I like the flavours in this cake. Beautiful recipe, stunning photos and gorgeous blog. I adore cardamom and am always on the lookout for new recipes to use it in. I’ve never heard of jaggery before, but I will definitely check it out. So happy to have found your blog! Gorgeous photos! This looks stunning and delicious! A perfect combo. Saved the recipe for a special occasion. I’ll definitely be updating how it goes! It might even appear on my site!